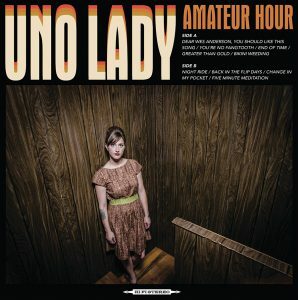 By James Carlson, Examiner.com – “Cleveland indie singer/songwriter Christa Ebert, or Uno Lady, bills herself as a “one-woman choir,” and that is probably the most fitting description of what she is. That is to say, she is a one-woman choir insofar as her songs are born of the most human of instruments, the voice, in this case her voice, which she feeds through musical devices such as a microphone, small mixer and loop pedal. A minimalist endeavor, for sure, yet one that yields unexpected and impressive results: primary vocal tracks adorning layered vocals that act as the artistically interwoven threads with which the bodies of the songs are held firmly together.